A joint venture of The Bluestone Organization and Alexander Development Group, and institutional investors advised by J.P. Morgan Asset Management, 42 Broad is a luxury transit oriented development (TOD) located three blocks from the Metro-North Railroad Harlem Line (Fleetwood stop) in Westchester County, NY. 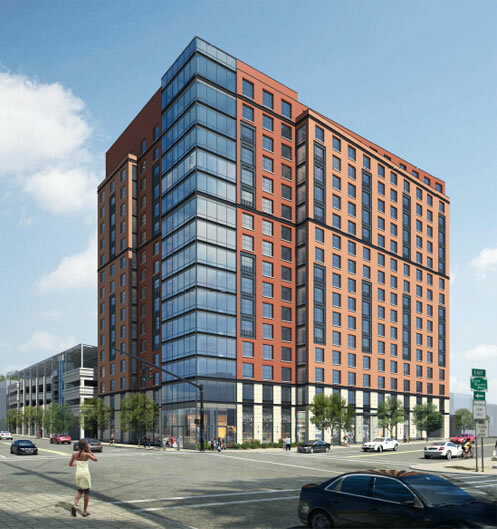 The 16 story building with first class tenant amenities will encompass 249 luxury rental apartments, 20,000 SF of retail, and an adjacent parking garage. Amenities include a heated swimming pool, large community/party room, fully equipped gym, and a library/reading room. Located in Fleetwood (a prosperous community in Mount Vernon adjacent to Bronxville), the site is easily accessed via an on-off ramp of the Cross County Parkway directly across the street. The building is destined to be the most energy efficient large scale multi-family building in the county.